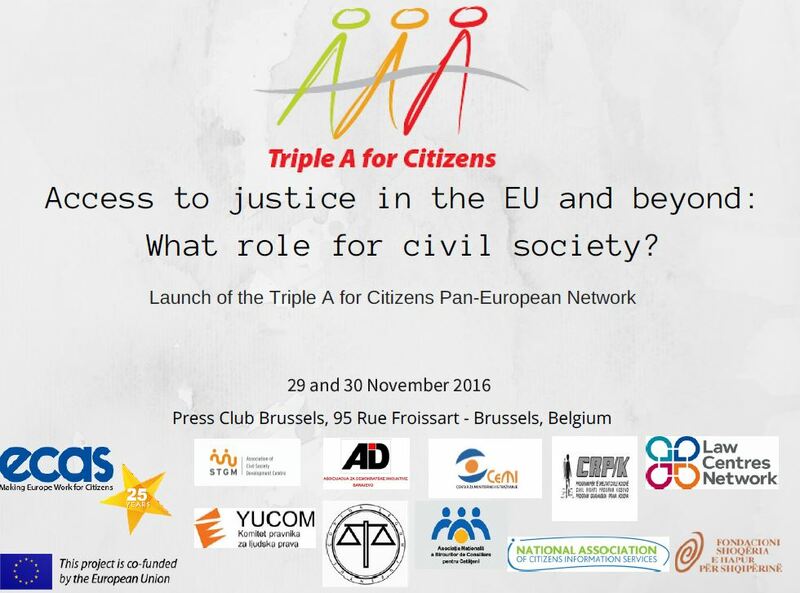 As project leader of Triple A for Citizens funded by DG NEAR, ECAS is organising a conference in Brussels on 29 and 30 November 2016, which will be the closing event of this 4-year project. At the same time, the Conference will launch the ‘Triple A for Citizens European Network’, which is open to all European organisations who provide free advice services to citizens. The first day will focus on citizens’ acccess to justice in times of crisis and the role that civil society organisations can play in that regard. The last panel will be followed by a cocktail to officially launch the Triple A pan-European Network. The second day will be devoted to the achievements of the Triple A project. Quality standards for providers of free legal aid will be presented by the project partners, together with other project outcomes. The project Triple A for citizens – Access to information, Advice and Active help – is implemented in the framework of the European Commission’s Partnership programme for Civil Society organizations. The project targets the Western Balkans and Turkey and it is based on the principle that everyone has the right to be informed about their rights and find remedies for their enforcement.